DarkOhm & Polux represents the combined efforts of two experienced producers from the Venezuelan underground: Daniela Peña AKA Veda and Daniel González AKA DarkOhm. 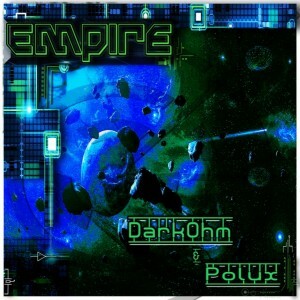 Empire is a fresh collection of dark psychedelic sounds chronicling the recent adventures of this Latin American production team alongside collaborations with Nostromus, Somarobotics, and Kanibal Holokaust. Artwork by ParaShakti. vEEEdAAA!! congrats hermana! Got it, and i must say it's SMASHING! Please give my love to Daniel also! Woo! Its been awhile since ive heard anything from Darkohm! Congrats to both of you guys! D/L NOW!! Retohmorgon thanks friend hope did you enjoy DarkOhm !!! Thanks for downloading and for the support, all the best for all of YOU!!! CoNgRats Veda totally ammaazzed with your talent same goes to DarkOhm always! Ganika thank you very much, i´m glad that you like it , big kiss beauty sis !!! This one is impressive, congruent masterpiece! Very happy with free lossless download! ‎.｡. :*⁂【Have fun with Faulty Robot by Polux】⁂*:.｡.